Free Study Guide & Taxi Lesson! Now that January is finished, and you have had a bit of romance (Happy Valentines Day!) I’d like to ask you a question. Do you remember the last time that you had to take a taxi in an English speaking country? I hope that it was a good experience, but maybe you found the situation frustrating and stressful. -How do you explain where you are going? -How do you give directions if you know where your destination is? -How can you ensure that you do not pay too much for the trip? -Should you make conversation or sit silently in the back? -English for travel...is it different than normal English? In this month’s newsletter we are going to look at everything related to taking a taxi...and give you a free report too! Taxi = cab. These two words mean the same thing and can also be used together: taxi cab. The meter = the machine that tells you how much you owe (the amount of money you must pay). Back seat = the seat in the back or rear of the car (behind the driver). Passenger seat = the seat beside the driver. 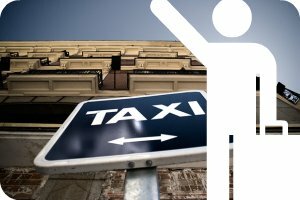 Taxi rate = the amount of money that you pay per kilometre or time period. Airport surcharge = this is an additional charge that is added onto trips from airports. Traffic Jam = when traffic is not moving quickly or at all. The trunk (USA) or the boot (UK) = the place at the back of the car where you store luggage. 1) Telling the driver your destination. Take me to ___________ please. I need to go to ___________ please. 2) If you would like the driver to stop at your current location. 3) When you are close to your destination but want to exit the taxi early. Here is fine thank you (thanks). 4) When you want to know the cost of the trip. 5) Asking for a receipt for the trip (to prove the cost). Could I have a receipt please? Here are some things that the cab driver might ask you to make small talk. 1) Where are you from? - I'm from Canada. 2) How long are you in town for?- I'm here for the weekend. 3) Business or pleasure?- Business. I am here for a conference. 4) What is it like in _______ (Canada)?- It's really nice. Very cold in the winter though. 5) Have you ever been to _________(Madrid) before?- Yes, I used to live here actually. 6) Did you have a nice flight?- No I didn't. We were delayed for 3 hours in Frankfurt. Here we will look at some very common expressions used to give directions. They are very useful, especially if you know where you are going. *Go past _____________(rockfield street or the bus station). *Go north, south, east, west on __________(rockfield street) until you reach_____. Take a look at the map above with the pink arrows. What I would like you to do is write the directions that you would give to the taxi driver (if you were in the car and it were moving along each arrow). 1)	Take me to the Jolly Hotel St. Ermin’s please. 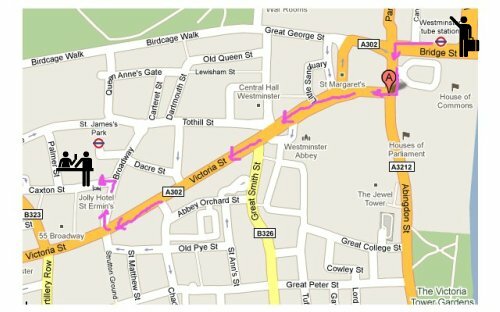 2)	Take a left on Abingdon Street and then take the next right on to Victoria St.
3)	Continue down Victoria Street past Westminster abby. 5)	Keep Going until your reach Broadway. Take a right on Broadway St.
6)	Then take a left onto Caxton Street. 7)	It is on the left. Here is fine. Thank you. With these new words and expressions I am confidant that you will be able to take a taxi without any problems in an English speaking country. You do want to be very careful with your pronunciation though, and if you are not confidant that you can pronounce the address properly be safe and show the taxi driver the address written on a piece of paper. So that is it for now! 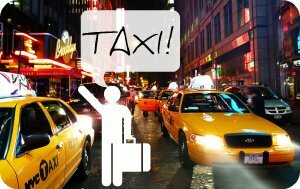 I hope you have enjoyed this topic: "taking a taxi" and if you happen to find a mistake or you would like to discuss this topic, feel free to leave a comment by visiting the above link and scrolling to the bottom of that page. Wait a minute! You thought I forgot didn't you! Your free report! I was saving the best for last. I know that studying for exams can be difficult so I wanted to give you some general tips and tricks to help you do better on your exams. Download your free copy of my exam tips and tricks report here. Start using English in the Learn English Corner: ESL Cafe! I currently have 1856 subscribers to my newsletter and I would love to hit 2000!